Alison Collin's "Of Sluices And Sisters"
These often amusing and sometimes very poignant reminiscences were originally submitted to share at a Saint Bartholomew’s 40th nursing class reunion. 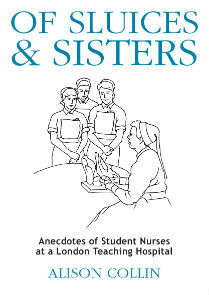 Having been recounted orally for many years they now appear in print for all to enjoy, painting a picture of what it was to be a student nurse in the 1960’s - a time when legendary Ward Sisters ruled supreme, starched white aprons were the hallmark of a nurse, and wearing make-up was likely to result in severe reprimand! Patients going berserk in the night, nurses hitching rides on meat lorries - these are only some of the events outlined, running alongside tales of what went on in those wards, by day and at night, including some quite personal and varied reflections of those in training. Readers certainly don’t need a medical background in order to enjoy these anecdotes, but those who trained as nurses during that era will find many nostalgic moments with which they can identify, while contemporary nurses are given insights into how different their profession was in the not-too-distant past. Read some extracts from "Of Sluices and Sisters". "Of Sluices and Sisters" is now available all major booksellers and online bookstores. If you visit Bishop, in California's scenic Eastern Sierras, look for it among the books by local authors at Spellbinders Bookstore. Many people are unfamiliar with the term Sluice, and in the United States this automatically brings up images of gold prospecting with water rushing through sluices to remove the unwanted rock debris. However, sluices in the context of nursing represent the china sink with a flushing device into which the contents of bedpans were tipped. Before going off duty in the evenings it was not uncommon for the junior nurse to have up to a dozen dirty bedpans to deal with, so in one's early career one saw an awful lot of the sluice. The room in which the sluice was housed was also known as "the sluice" and was sometimes used as a place of refuge, away from the eagle eye of the sister, a place where one could take a breather from a frantically busy ward, or shed a few quiet tears on behalf of a patient. There are some professions which automatically give rise to stories which intrigue those of us outside their ranks; missionary work, teaching and veterinary practice are among such. It now seems time to reminisce about nursing in the middle of the 20th century and share some of these entertaining stories, and at the same time record something of the state of hospitals and nursing during that period. If you wish, send Alison a message.